Future LDS Church leader writes FBI's Hoover: "How can… [Eisenhower] …be so effectively used as a tool to serve the communist conspiracy?" His letter to FBI Director J. Edgar Hoover was packed with political dynamite, so Ezra Taft Benson marked it "personal-confidential." 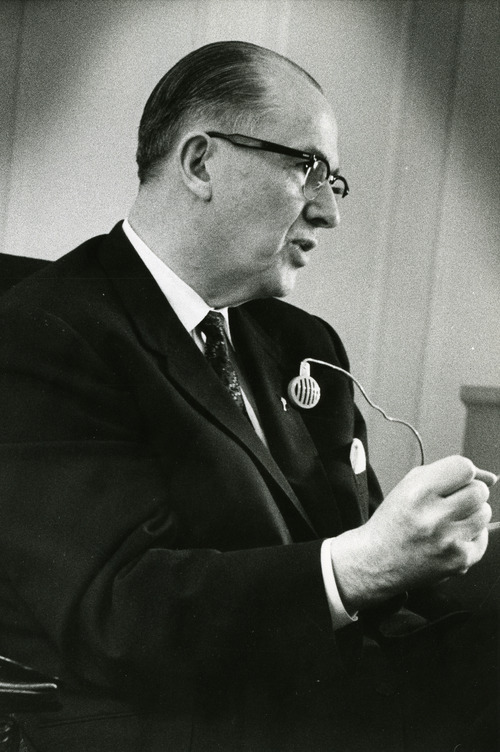 Benson  the only man to serve in a presidential Cabinet and later lead a worldwide church, the Mormons  was attempting to convince Hoover that the John Birch Society was a clear-thinking anti-communist group. So he wrote how it had convinced him that a friend of theirs had been a tool of the worldwide communist conspiracy. That friend was none other than former President Dwight D. Eisenhower, for whom Benson had served as secretary of Agriculture from beginning to end of his eight-year presidency. 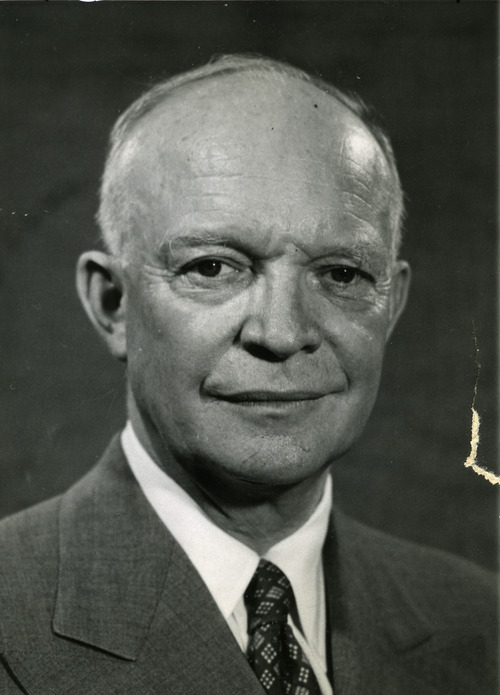 "In my study of the [communist] conspiracy, which I am sure is weak compared with your own, the consequences of Mr. Eisenhower's actions in dealing with the communists have been tragic," Benson wrote. 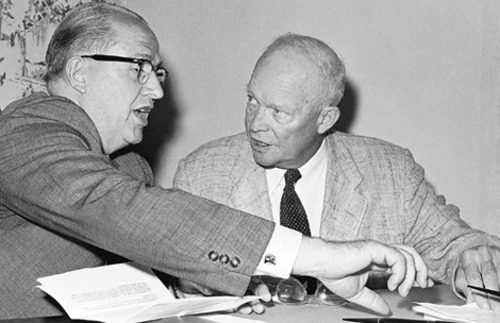 He argued to Hoover, whom he viewed as a friend and fellow fighter of communism, that Eisenhower helped communism's spread more than he hurt it, perhaps because it had been the expedient thing to do for an ambitious politician. "What difference does it make if your house is burned down by an ignorant man, a person who wants to get warm fast, or an arsonist?" he wrote about the former president. "There is little difference." He said because freedom was threatened by soft stands against communism, he pondered making public such feelings "even at the risk of destroying the influence of men who are widely respected and loved"  including Eisenhower. That and other letters in Benson's thick FBI file, obtained through a Freedom of Information Act request, suggest that Benson was an early tea partyer  one who would become an inspiration 50 years later for that modern movement. Like the current tea partyers, Benson worried about threats to freedom and the Constitution. He feared that too many powerful officeholders  up to and including the U.S. president  were not standing up for the Constitution, and instead aided its enemies, out of ambition, expediency or other, more sinister motives. The New Yorker magazine, in its Oct. 18 issue, included Benson as one of the tea party's ideological founding fathers  which it called its "confounding fathers" noting how Benson's public writing and speeches are quoted and admired by commentator Glenn Beck, an icon of the movement. 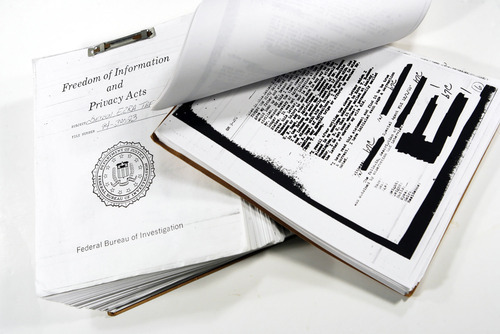 The FBI files on Benson show a behind-the-scenes battle in which he sought to persuade the bureau not to condemn the John Birch Society, formed in 1958 by Robert Welch and named for a missionary-turned-soldier killed by Chinese communists after World War II. Interestingly, files also show that Hoover's FBI twice spied on Benson  possibly for Eisenhower  to determine whether he might resign from the Cabinet during times of widespread criticism. Files also show that Hoover lied in later years to avoid Benson, seeking to distance himself from Benson's support of the Birch Society. Looking back • Benson's son, Reed, and Reed's wife, May Hinckley Benson, said in a recent Salt Lake Tribune interview in their Provo home that they are not surprised about the views contained in the FBI files. They watched up close as Ezra Benson formed a hatred of communism because it destroyed personal and religious liberty. 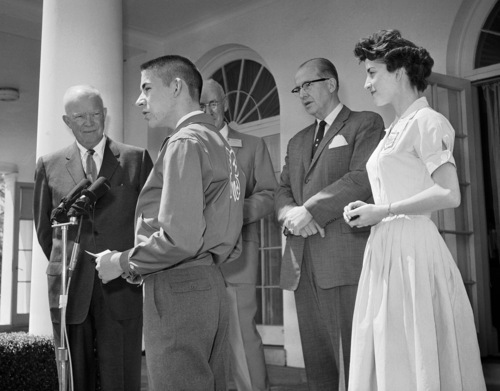 He sometimes expressed frustration to them that Eisenhower and America were not doing more against it. "When he felt he was right, he was amazing" in how hard he would fight, May Benson told the newspaper. They said his hatred of communism was rooted in his experience as a new apostle sent by the LDS Church to oversee its relief efforts in Europe after World War II. Benson later wrote that he watched half of the continent quickly fall to communism and lose the right to worship freely. Reed Benson said that when his father was chosen as Agriculture secretary, he knew one of the first cells of communists found in the government had been in that agency. So, FBI files show, Benson took what was then an unusual step (although routine now) and asked Hoover to conduct a background check on him to ensure his loyalty. The only problems found were a few parking and speeding tickets. Files show that Benson wanted the same scrutiny for his top aides; the FBI did background checks on them, too. Early controversy • Just after taking office in 1953, the Utahn became the first member of the new Cabinet to create controversy by attacking government farm subsidies  worrying aloud that they were too socialistic, which upset many farmers and their members of Congress. Major media at the time  including the Saturday Evening Post and The Nation  conjectured that Benson was "expendable" or might be "promoted to an ambassadorship." The news media were not the only ones looking into whether Benson might go. Hoover's FBI was also doing a little spying into that. 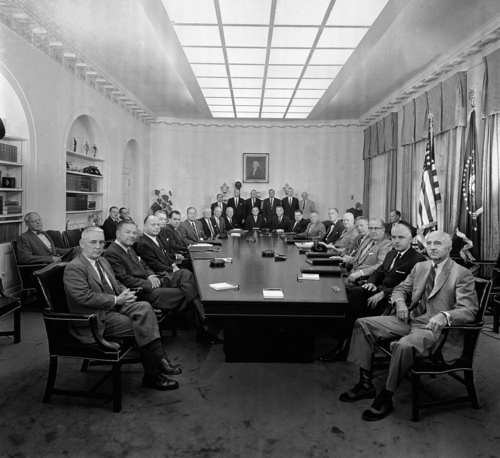 For example, a Nov. 20, 1953, FBI memo says that an undersecretary of state (whose name was censored from released files) informed the FBI that "the president is a little 'teed off' with Secretary of Agriculture Benson" because he "has not been successful in quieting the farmers, cattlemen, dairymen and Capitol Hill." The FBI memo said "the matter has now been passed to the White House and … the president is unhappy about the whole thing." It added that the State Department source said, "It looks like Benson will be the 'fall guy.' "
Why would Hoover and the FBI care whether Benson departed? 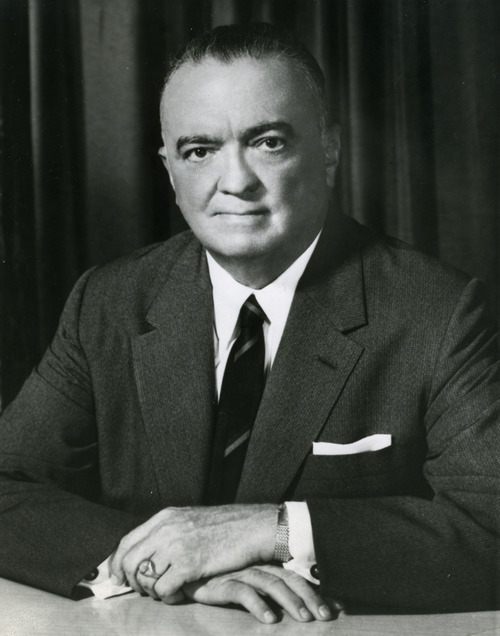 Others have charged through the years, and FBI files have shown, that Hoover sometimes investigated politicians of the era to use the resulting information to strengthen his own hand with presidents. While Benson weathered calls for his resignation in 1953, another similar storm came in 1957-58 over his attacks on dairy supports. Again, the FBI did some spying into whether he would resign, talking to aides and even Benson himself in passing. Whether Benson would go voluntarily would be of interest to the White House, but censors blacked out exactly where reports of the spying were sent. Benson ended up staying during all of Eisenhower's administration. Friends and allies • Amid the spying by Hoover, the FBI director managed to leave the impression with Benson that they were friends and fellow fighters against communism. Files show they exchanged copies of books and speeches. Hoover sent messages of encouragement when Benson was sick and when his stepmother died. He wrote a note of thanks for Benson's service when he left the Cabinet. He also once invited Benson to have his son, Reed, apply to become an FBI agent. 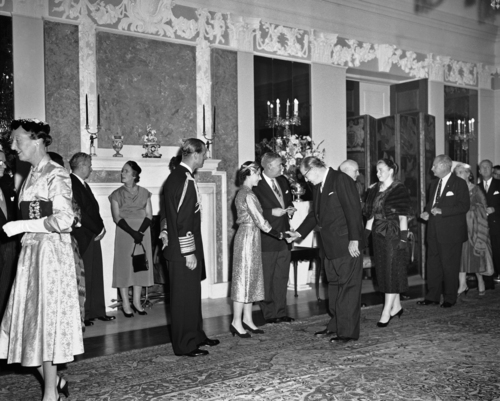 In turn, Benson invited Hoover to speak at an LDS Church general conference (which Hoover declined), to attend a concert by the Mormon Tabernacle Choir with Benson's wife, to allow the LDS Church's Deseret Book Co. to print a compilation of Hoover's speeches (which did not happen), and even to attend a song recital by one of Benson's daughters. "I realize that only in the next life will we fully appreciate all you have done to preserve freedom in this country," Benson wrote Hoover in 1965. "I am most grateful for your exposure of the communist conspiracy and for the wonderful organization you have established in the FBI." Frustrations • But Benson was not so happy with others in the Eisenhower administration. Reed Benson said his father tried to persuade the State Department, for example, to rethink its support of Fidel Castro in Cuba after Agriculture attachés warned Benson that supporting him could lead that country to communism. 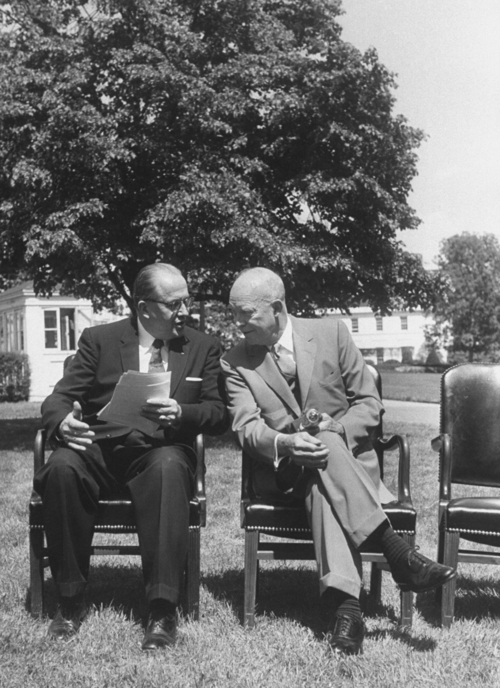 He was also upset at Eisenhower's orders for Benson to take Soviet Premier Nikita Khrushchev to an agricultural experiment center near Washington in 1959. Benson said in a 1967 speech, "I opposed his coming then, and I still feel it was a mistake to welcome this atheistic murderer as a state visitor." With such frustrations, Benson became involved with the John Birch Society once he had left office. 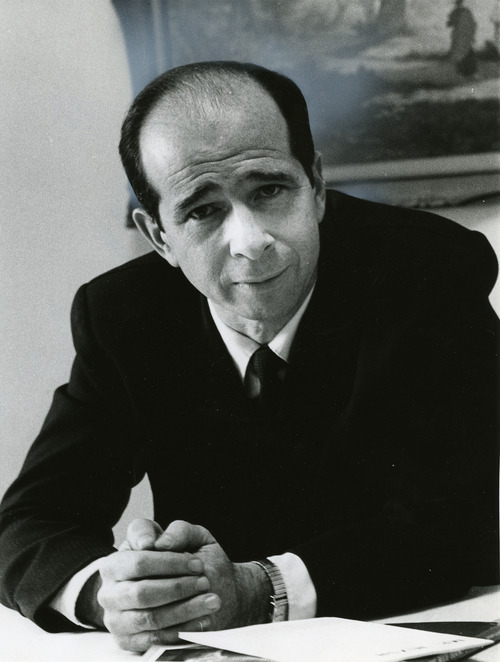 After Reed Benson lost a run for Congress in 1962, he said the society approached him, and they found they shared beliefs. "The John Birch Society believed in less government, more individual responsibility and a better world," Reed Benson told The Tribune. When the society offered Reed a job as its Utah coordinator, FBI logs show that his father made a phone call wanting to know what the bureau felt about the group. It was the beginning of Benson's defense of the society. An agent wrote, "I informed him off the record … that to my knowledge the FBI has not investigated the John Birch Society." The agent added in summary of the conversation, "Benson has reached the conclusion the society is doing a lot of good in combating communism and feels that it is patriotic in its motives." Benson also told the agent that he hoped to soon meet with Hoover in Washington "to confer with him about the menace of communism and the role of the Birch Society." Because of that, officials at FBI headquarters wrote a briefing paper to prepare Hoover in case Benson called. Calling the society "probably the most publicized right-wing extremist group in the country," they recommended keeping Benson away from Hoover  including lying, if necessary, to say that Hoover was unavailable to talk to Benson. Godless communism • On May 17, 1965, Ezra Taft Benson wrote to Hoover with a plea. 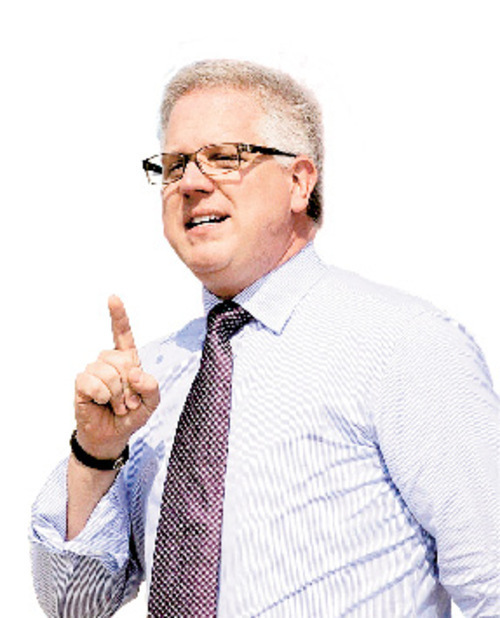 "Word has come to me, not yet fully confirmed, that some of our liberal 'soft-on-communist' groups are planning to put pressure on you to come out with a statement against the John Birch Society." He urged Hoover not to do so. "It is my conviction that this organization is the most effective non-church group in America against creeping socialism and godless communism," Benson wrote. Hoover, however, in response to a question at a news conference soon thereafter, said he had little respect for the society or its founder, Robert Welch. 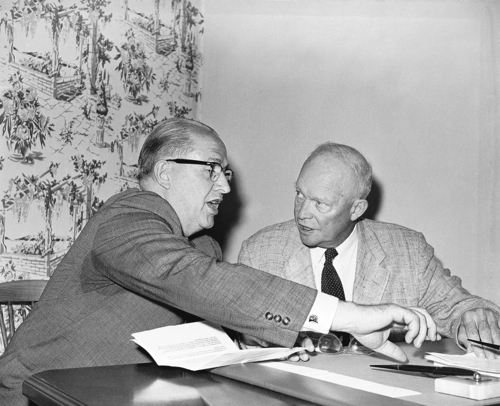 After Hoover's disavowal of Welch, Benson decided to meet with Hoover to explain his support of the society and how Welch's writings had convinced him that Eisenhower aided communism. Files show that Hoover's aides twice told Benson that he was unavailable for such a meeting  as memos had advised them to do. So Benson wrote Hoover the sensitive "personal-confidential" letter of May 28, 1965, outlining his conclusions about Eisenhower. Benson also soon sent a book by Welch titled The Politician, noting it was what led him to his conclusions about Eisenhower. In the book, Welch argues that Eisenhower was either ignorant, a politician blinded by opportunism or was "consciously aiding the communist conspiracy"  and said it really didn't matter because "they all come to the same end … namely tragedy." "Have just finished this shocking volume. ... While I do not agree with all or the extent of some of the author's conclusions, one must agree that the documented record makes the thesis of the book most convincing. 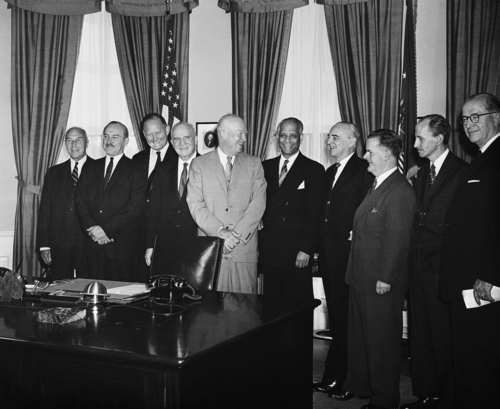 "How can a man [Eisenhower] who seems to be so strong for Christian principles and base American concepts be so effectively used as a tool to serve the communist conspiracy? "I believe the answer is found in the fact that these godless communist conspirators and their fellow travelers are masters of deceit  who deceived the very elect. How our people need to be alerted and informed." Benson added that he hoped the $1 book would be made available widely. "This story must be told even at the risk of destroying the influence of men who are widely respected and loved by the American people. The stakes are high. Freedom and survival are the issues," he had written in his copy of the book. 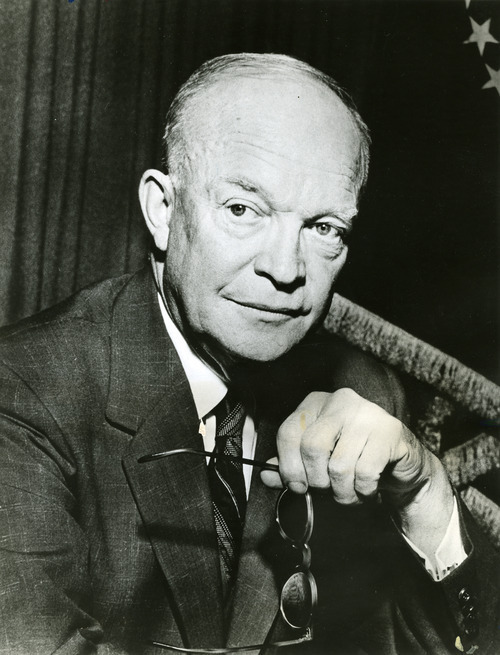 Benson also wrote of Eisenhower: "I presume I will never know in this life why he did some of the things he did which gave help to the [communist] conspiracy. It is not my divine prerogative to know the motives of men. It is easier, however, to judge the consequences of man's actions." Noncommittal • Hoover sent back only a short note: "It was indeed thoughtful of you to furnish me your views regarding the John Birch Society and its head." He concluded simply, "I have taken note of your impressions." Such impressions would lead Hoover to take the advice of aides and largely cut contact with his friend. That included declining an offer to have the LDS Church-owned Deseret Book Co. publish a compilation of Hoover's speeches. Aides warned that because of Benson's letters, "If we were to go along with this project, it could in some way be used to the advantage of the John Birch Society." Still, Benson kept up cordial correspondence with Hoover over the following years  and sent him John Birch Society materials on several occasions. In 1971, he again requested a meeting with Hoover while Benson was in Washington for a few days for a church conference. FBI headquarters staff also frowned upon that request. "It is not believed that the director should take time from his busy schedule to meet with Mr. Benson, as it is very possible that he would bring his son Reed Benson with him for that meeting," who, the memo said, was then the national director of public relations for the John Birch Society. When Reed Benson called to check on the availability of Hoover to meet with him and his father, FBI memos say, "The director indicated at the time he was booked solidly"  as memos from staff had suggested he should say. Hoover died only a few months after that last requested meeting. Benson would live another 22 years  enough time to ascend to the presidency of his church and to see the fall of communism in Eastern Europe. He spoke little of that fall, however, focusing on more spiritual matters of his church, including urging LDS members to constantly read the Book of Mormon. Benson died at age 94 in 1994. Former Mormon president as tea partyer? Oct. 7, 1943 • The Church of Jesus Christ of Latter-day Saints ordains him as an apostle. Post-World War II • Oversees rebuilding efforts in Europe for the LDS Church, personally saw several countries fall to communism. 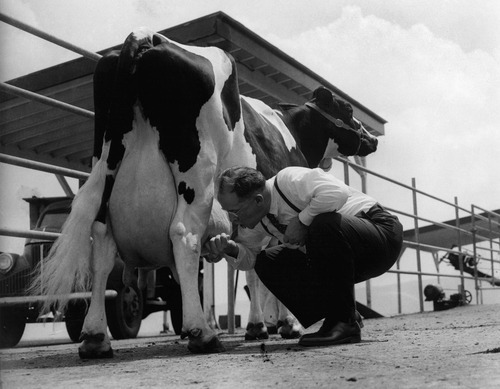 January 1953 to January 1961 • Serves as U.S. secretary of agriculture for President Dwight D. Eisenhower. November 1953 • FBI files show it spied on Benson to see if he might resign as Agriculture secretary because of controversy over his stands on agriculture supports being too socialistic. 1957-58 • FBI files show it spied on Benson again to see whether he might resign amid controversy. May 28, 1965 • Writes Hoover telling him how the John Birch Society persuaded him President Eisenhower helped communists. 1965-71 • FBI memos repeatedly suggest to Hoover that he avoid requested meetings with Benson to avoid appearances of supporting the John Birch Society. Hoover does not meet with Benson again. Nov. 10, 1985 • Becomes president of The Church of Jesus Christ of Latter-day Saints.